Introducing a scalable new system for configuring versatile and highly effective PA applications. The SX-2000 Series features new matrixing capabilities, so a single system can have its components distributed in different locations, yet under centralized control. Ideal for large-scale installations ranging over multiple buildings as well as local systems, the versatile SX-2000 Series is particularly well-suited for airports and railway stations, factories, shopping malls and large offices. Versatility is ensured by such features as a dual power source and redundant backups for fail-safe operation, making it a cost-effective solution for virtually any installation, and without long lead times or the expense of a custom system. A fireman's microphone feature is also included, for enhanced effectiveness in an emergency. SX-2000 Series components enable creation of an ideal system for all sorts of application requirements. 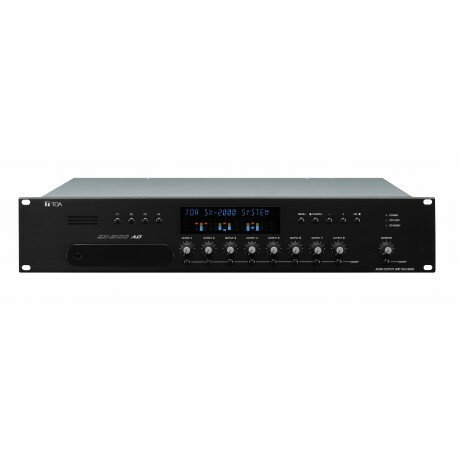 Technical data sheet for the TOA SX-2100AO audio output unit.